A commitment to natural, quality ingredients. A promise to source and deliver unique, useful products. A product line we and our customers can be proud of. A small company, driven to make a big difference. 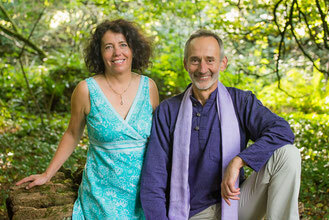 We are Zeljko and Ana Bozic, the husband and wife team who started The Clay Cure Co. UK. We founded our company based on a calling to honour the Earth. We came across a rare original copy of the book OUR EARTH OUR CURE (L'argile qui guérit) by the French Naturopath Raymon Dextreit,. Amazed and intrigued by what we read, we started trying the clay ourselves and felt its subtle and deep effects on our own lives. The more we used the clay, the more we transformed, and recognised the truth of what we were studying, and the more interested we became. We started to recognise a mission to bring these ancient healing practices back into vogue. Since 2015 we have been in an expansive and creative phase, putting our hearts into designing the company, researching and adding new products that are purely sourced from all over the earth (France, Sardinia, Turkey). We combine formulas used and proven over millennia with a certain contemporary flair and alchemy. At home all our personal care products, from tooth powder, natural deodorant to shampoo are all based and made with natural ingredients. We have found that these clays and salts of the earth work better than man-made chemical alternatives. Since we started using the clay internally and on our skin, our bodies have become palpably different. Softer, clearer, more relaxed and vital. Clay has allowed us to feel so much more connected to Mother Earth, and every day we are in conscious gratitude at having clay in our lives. Free from additives, chemicals,synthetic fragrance or dyes.